The damson is the first fruit tree to flower in my garden. This year the blossom is late. Today I spotted a haze of white froth against the clear blue sky. You’ll see them in the hedgerows now. It’s worth inspecting the twiggy trees closely to see the tiny beautiful flowers and all the beneficial insects they attract. Damsons are brilliant for beginners. They are really easy to grow as they need no special attention. They come true from seed – the damson stone will produce an identical plant to it’s parent… but it can take up to 15 years to grow and fruit so you’ll need a bit of patience. The quickest way to get a fruiting plant is to take suckers produced by a mature tree. Ask a kind friend or buy a named variety from a good plant nursery. A member of the plum family, damsons are deep purple fruit with a tart flavour. Small white flowers are produced on bare branches in April followed by soft green leaves and then masses of plum like fruit in September. Height and Spread 2-4 metres. They like rich heavy soil and thrive in areas with strong wind and cold winters. 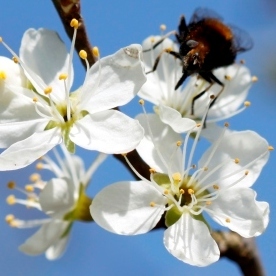 They can cope with less sun and higher rainfall than plums… but they won’t grow in waterlogged ground. Damsons are usually ready to eat during the last two weeks of September. Harvest them promptly or the birds will have them all. Bite into a damson and what do you taste? Soft ripe juicy flesh with an acidic tang. Delicious with cheese and biscuits after a meal… but some people find damsons too tart for eating straight from the tree. Damsons are brilliant for pies, crumbles and damson jam. My favourite is damson gin. Place the jar in a cool dark cupboard and turn upside down daily to dissolve the sugar. Last year we made Damson & Blackberry gin. It was absolutely fabulous.